This photograph of Castle Peak in the White Cloud Mountains appeared on the cover of Life magazine. Taken by Ernie Day, the image played a crucial role in the creation of the SNRA. It goes without saying that Ernie Day captured the nuanced majesty of central Idaho's mountains with his camera, but the mountains captured part of Ernie Day's soul. A gruff man with an unchecked tongue, Day had a subtle eye for light and shadow. A Republican real estate agent from Boise, Day's passion and contribution helped fuel mammoth preservation efforts like the Frank Church-River of No Return Wilderness Area and the Wilderness Act. But a single, widely published photograph in which Day captured Castle Peak had watershed influence over the course of Idaho history. 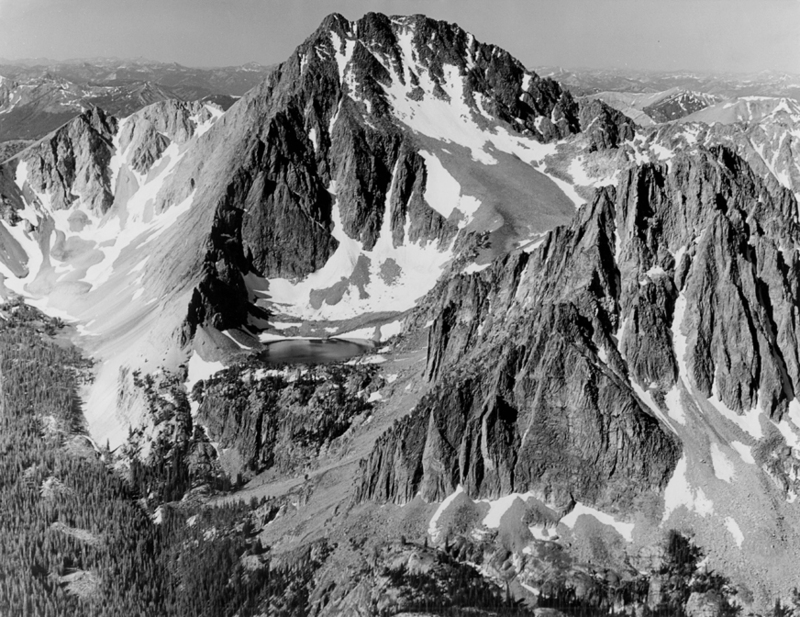 Published in Idaho newspapers and eventually on the cover of Life magazine, the aerial view of Castle Peak helped win public opposition to the molybdenum mine that would have gutted its northeast flank. On August 2, 1970, conservationists bought a full-page ad in the Idaho Statesman. A 4-inch bold headline read "SAVE THE WHITE CLOUDS." The photograph ran next to an artist's rendition of the massive gash that would be created by the proposed molybdenum mine. "The picture of Castle Peak is a beautiful one," said four-time Idaho governor Cecil Andrus. "I'm sitting here in my office looking at another picture taken by Ernie Day of the Sawtooths and Alice Lake. Ernie's skill with a camera was utilized many times and in many different battles that we fought." At Day's memorial service on February 22, 2008, Idaho environmental leader Pat Ford reflected about his recently passed mentor. "When I think of Ernie Day, I always first see him together with Ted and Bruce—Ted Trueblood and Bruce Bowler—three friends who led the River of No Return Wilderness Council, meeting every month and then every two weeks in the basement office of the Idaho Conservation League from 1977 to 1980. That's when I came to know them and how I came to know them—as a group. "… But at that time, when I came to know them and when America's greatest wilderness achievement outside Alaska [the River of No Return Wilderness in Idaho] was won, they were the leaders, and they were my leaders. They are my heroes forever." Ford said he remembers a morning waking in a sleeping bag on the front porch of Day's Fisher Creek cabin, which afforded panoramic views of the Sawtooths to the west. Day had set up a tripod the night before. He was awake at first light watching the Sawtooths greet the sun. "He'd look, then he'd look through the viewfinder, then step away to his coffee, then come look again. He was waiting for the light. When it came only his finger moved. This was my first look at another side of Ernie—his quiet eye, his delicate eye for how light greets and reveals rock, water and sky. … Once I had seen that quiet eye in practice I could hear it when he spoke. I could see it in what he did." Day's influence went straight to the heart of the modern-day wilderness movement. He and others are credited with more than staving off a molybdenum mine at Castle Peak and winning lasting protections for the Sawtooth National Recreation Area. They are credited with influencing Sen. Frank Church, who was the 1964 Wilderness Act's Senate floor sponsor. "Church was educated by these guys," said Boise attorney Jeff Fereday at Day's memorial service. "Church was constitutionally predisposed to agree with them. These were not his issues. He played on a much bigger field. It really was people like Ernie, Ted and Bruce who said, 'Look, this is important.' Church was intelligent enough and had Idaho roots deep enough that it really rang a chord with him." In many ways, Day and his cohorts left indelible marks on Idaho and on conservation in general, but still his Castle Peak photograph stands out. "Ernie's photograph of Castle Peak must, I think, be the most influential visual image in Idaho's modern history, as far as impact on public perceptions, public opinion, law and the large place the SNRA has come to occupy in our state and for [us], her people," Ford said. "Thirty-five years after its creation it seems inevitable. It wasn't. Ernie is at the head of the list of those whose determination and work brought it to being."